When you retire, you can choose from a selection of pension options including normal, guaranteed-term, single-life or joint-life pensions. All pensions are paid for your lifetime, and all are based on the same value. The monthly payments vary because of differences in the survivor benefits available to your beneficiaries after your death. The choice that is best for you depends upon your personal circumstances including your health and marital status and whether you and your spouse have other sources of retirement income. These choices must be carefully considered because once your pension commences the choice is non-revocable. The value of your pension at your retirement date is based on providing you with a monthly pension based on your earnings and years of service for the rest of your life. Pension payments end at your death; however, the Civic Plan provides a minimum 5 year guarantee, which means that in the event you pass away less than five years after retirement, the equivalent of the payments remaining in that five-year period are paid to your beneficiaries. This is referred to as the ‘Normal’ or ‘Single-life Five Year Guarantee option’. Options are also available for a 10 year and 15 year guarantee period. These options result in reduced initial pension payments, but provide greater benefits for your beneficiaries in the event that you pass away before the end of the guarantee period. Under Saskatchewan law, if you are in a spousal relationship, you are required to select an option that provides benefits to your spouse after your death, unless your spouse independently agrees to waive that right by signing a waiver form within 90 days prior to your retirement date. This means that your pension will be reduced initially, to provide benefits that continue for your spouse’s lifetime after your death. In Saskatchewan, the minimum that a person in a spousal relationship must provide for their spouse is 60%, but a member may take an even greater reduction in initial pension payments to provide a higher percentage (75% or 100%) for their spouse. Some members may have a need for higher income from early retirement to age 65, when CPP and OAS benefits typically start. The Plan provides the option of “Integration” to achieve this. Integration is essentially ‘borrowing’ against your post-age-65 benefits to fund your benefits from early retirement to age 65. It is intended as a means of levelling retirement income from the Plan and government sources before and after age 65. 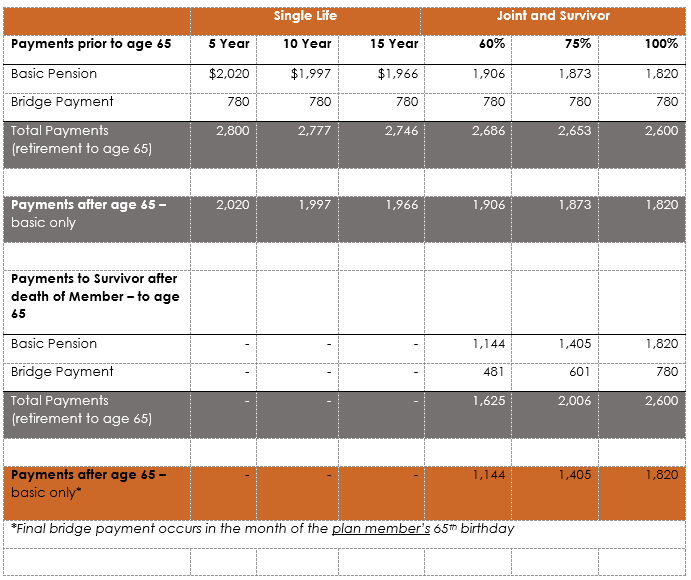 The calculations assume a member will receive maximum benefits from CPP and OAS at age 65. 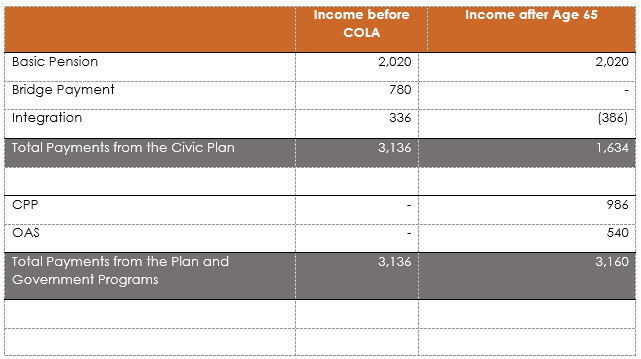 Changes in those government programs could impact a member’s overall income. Integration is less effective as a method of levelling income if a member chooses to start CPP payments on a reduced basis before age 65. In this example, it is assumed that full CPP at age 65 is $986. To help you make your choice, contact Möbius Benefit Administrators Inc. well in advance of your retirement date to get a personalized quote of your estimated pension payments under different scenarios. Consult a trusted, experienced financial advisor (or two) to help you plan your financial picture in retirement.